Pipeline Construction Porta Potty Rental | Texas Waste Co.
Large scale construction projects like pipeline construction that are on going and involve many spreads will require a custom approach to sanitation provisions. Our pipeline construction porta potty rental experts can provide the perfect sanitary facility count and unit type to meet your budget and project demands. These sanitation units are specially designed to withstand the sometimes harsh conditions of a construction site while providing well-appointed restrooms and wash stations to ensure that your pipeline construction site is up-to-code and meets the needs of your employees, colleagues and clients. 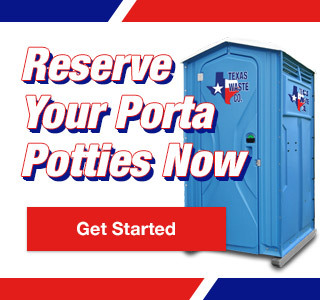 To simplify the pipeline construction porta potty rental process, we offer same day delivery and a prompt cleaning schedule because we know that the only thing worse than working in the Texas heat is an unsanitary porta potty. Each unit is also transportable to move as your project progresses. To guarantee optimal working conditions for your next pipeline construction project, look no further than Texas Waste Co., where we stand by our reputation for delivering the cleanest pipeline construction porta potty rentals around.